There is quite a bit to Dark Places that appears very marketable, at least on the surface. Flynn is popular and in high demand right now, the story shares a similar twisty thriller style as Gone Girl, and director Gilles Paquet-Brenner put together a fantastic cast, which includes Theron, Nicholas Hoult, Tye Sheridan, Corey Stoll, Christina Hendricks, and Chloe Grace Moretz. Watching the movie, however, it becomes clear that, despite all of this possible upside, these elements never come together in any meaningful way. There’s potential here, and while it goes through the motions, that’s all it ever does. Libby Day’s (Theron) entire family was murdered when she was six years old. Supposedly her brother, Ben (Sheridan as a youth, Stoll as a grown up), did the deed, she testified against him, and he has been in jail for the crime for 28 years. Since then she’s survived on donations from strangers who wanted to help a little girl and, as she says in awkwardly placed voiceover, she’s never had to do anything. But the cash reserves running dry, when a group of true crime enthusiasts called The Kill Club, led by Lyle Wirth (Hoult), come to her pointing out holes in the case against Ben, she takes their money and investigates the massacre, digging deeper and deeper into her past as she goes. The narrative is split into two timeframes, one which tracks present day Libby as she follows leads and looks for clues, while the other depicts the events from her childhood, building up to “that night.” Set up as it is, Dark Places resembles the case of the West Memphis Three, where a trio of teenage boys were wrongfully convicted of murdering three children, largely because they were into heavy metal and there were rumors of Devil worship. Ben is a character who could have stepped out of one of those Satanic Panic videos from the 1980s that seem so quaint now—remember when people were convinced Judas Priest and Ozzy Osbourne were leading the youth of America into the waiting arms of the Devil? He dyes his hair black, has Misfits posters on his walls, and pretends to be evil even though he volunteers in an after school arts program. Basically, everything about him is shorthand for weird kid in a small town. Libby is supposed to be scuffed up and bruised and broken, and while her surroundings fit this—she lives in a dumpy apartment, drives a beater car, and is a borderline hoarder—looking at her, you never see anything but Charlize Theron. With her perfect hair and nails and teeth, if all you do is slap a worn trucker hat on top of that, she still exudes the glamor of a major movie star. And aside from a personality quirk where she doesn’t like to be touched (who wants to be fondled by strangers? ), there’s little characterization besides this horrific thing in her past that is supposed to explain everything. It’s like the film says, “oh, she went through a trauma, she’s messed up,” and that’s all. Like Ben, Dark Places borders on caricature of a the tense thriller. The pace plods along for almost two hours as Libby finds one clue after another that leads her to the next plot point, and it’s easy to spot where it’s headed from a long way off. There’s little parallel between the two story threads, and everything the film does is almost like a spoof. When Ben and his “satanic” friends, including his girlfriend Diondra (Moretz), kill a cow, it’s more comical than evil, and at the moments where the film is supposed to be the most serious and harrowing, it’s often difficult not to laugh at how ridiculous the scenarios are. At one point an uppity white woman screams at Libby’s mother (Hendricks) about how they’re poor and that means her whole family is bad and terrible, and that’s as deep as Dark Places ever goes. With Gone Girl, David Fincher was able to take a similar neo-noir narrative and give it a slick, stylistic work up. That film leads you one way, only to shift perspective and subvert your expectations—just when something seems concrete, it pulls the rug out. 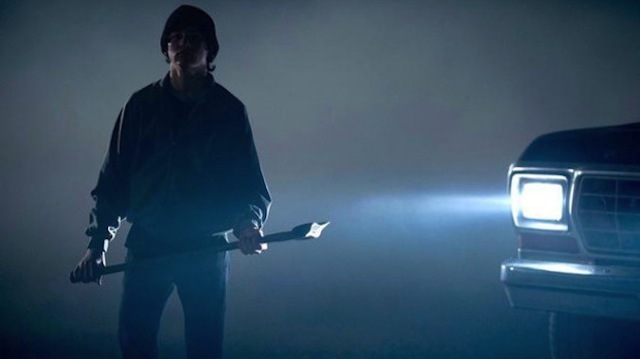 Dark Places, however, simply meanders along in one very obvious direction, and while the mechanics are fine, visually it’s flat, has little to no flair to distinguish it, and feels like watching an episodic police procedural on TV.